The alfredo sauce in this lasagna adds a creamy, flavorful taste with little cheese. 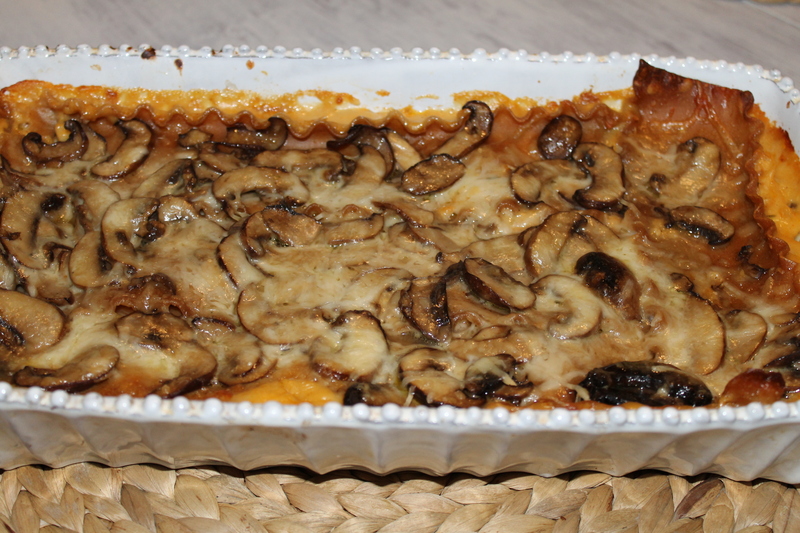 I used the base sauce to make a lasagna; although, you could mix the prepared sauce and the mushrooms with any other type of pasta to create a different type of pasta dish. This recipe may appear a little more intimidating than what I would call “simple” (at least it looks it to me), but the ingredients are fairly basic things that you most likely have on hand already. Wash mushrooms and remove stems from the caps. Slice mushroom caps and set aside. Chop mushroom stems. Melt 1 stick butter in saucepan over medium heat. Add chopped mushroom stems and cook for about 5 minutes. Add 3 T. garlic and 1 cup of chopped onions. Continue cooking for another 5-7 minutes. Season with salt, pepper, 1 tsp. paprika, and 1 tsp. thyme. Add 1/2 cup flour and stir. Slowly whisk in the 3 cups of milk. Continue stirring until thickened. Remove from heat and cover, stirring occassionally until ready to assemble the lasagna. In a skillet, heat 2 T. olive oil. Add sliced mushrooms and cook until the mushrooms are tender. In a baking dish, spoon 1/3 (about 1 1/2 cups) of the sauce. Layer lasagna noodles over the sauce. (You may have to cut some of the noodles to make fit) Layer another 1 1/2 cups of the sauce, or enough to cover, over the noodles. Pour half of the mushroom mixture over the sauce. Sprinkle 3/4 cup of parmesan cheese over the mushrooms. 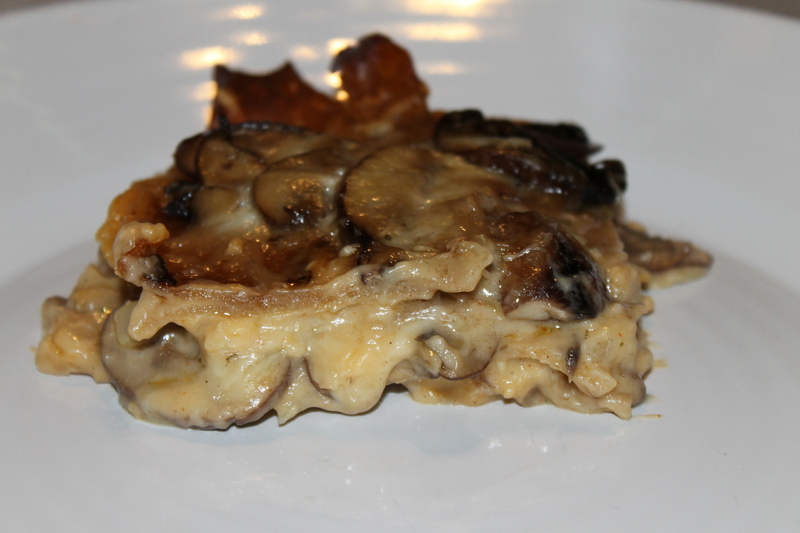 Repeat a layer of noodles, then sauce, then mushrooms, then top with remaining cheese. Bake, covered with foil, at 375 for 30 minutes. Remove foil and continue baking until cheese is bubbly on top. This pasta recipe is full of delicious ingredients that work so well in one dish. It is easy to prepare and filling. Try it served with a simple green salad. It is a great dish for a group of friends or a supper club. If you use it to entertain, start by serving some roasted garlic with parmesan cheese and olive oil and a loaf of french bread. I have to give the credit for this recipe to my neighbor, Sara. She is very much a taste-tester for most others recipes, but this one was cooked at her house! We love getting together to try new things and combine ideas that we will all enjoy. She says that she is “learning” how to cook but it always comes out great! Cook the pasta according to package directions. Drain pasta, return to pot and set aside. Season each chicken breasts with salt and pepper. Heat a non-stick skillet sprayed with cooking spray. Add chicken and cook until cooked all the way through, flipping throughout. (about 7 minutes per side) Slice the chicken into thin strips. In a large skillet over medium heat, heat 2 T. olive oil then add the garlic, sundried tomatoes, basil, balsamic vinegar and salt and pepper. Saute for about 3 minutes then add the spinach, cooking until the spinach is wilted, about 5 minutes. (Add spinach slowly and toss continuously. Continue adding spinach as it begins to wilt.) Add the olive oil and spinach mixture to the pasta. Stir in goat cheese and 2 T. pine nuts. Toss until cheese is melted. 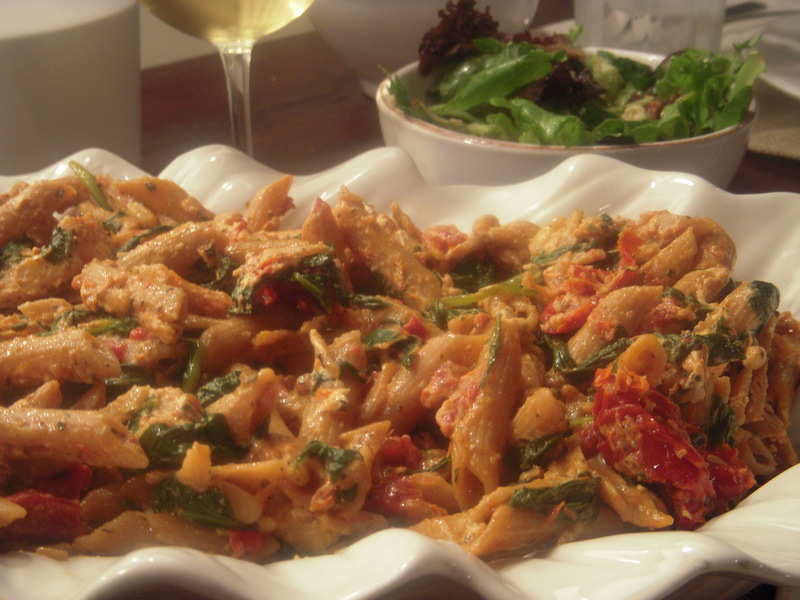 Transfer pasta into a serving dish and top with grilled chicken slices. Sprinkle with fresh basil if desired. This is a good one!!!! I will definitely be making this dish again and again. It has so much flavor and pairs well with a bottle of red wine! It is fairly quick to prepare and would be excellent for serving a crowd. I served it with a simple green salad and bread. Heat 1 tsp. of olive oil in a saute pan with a lid over medium heat. Add garlic and saute for about 1 minute. Remove the casing from each link of sausage and add sausage to pan. Sausage should be crumbly. Continue to break sausage apart as it cooks. Cook until browned, about 7-10 minutes. Drain sausage and place in a bowl to the side. Return pan to medium heat and add 1 T. olive oil and 1 tsp. garlic. Saute for 1 minute then add cut roma tomatoes and sliced roasted red bell peppers. Season with 1 T. rosemary, 2 T. thyme and 1 tsp. sugar. Cover pan and let cook for 10 minutes. Return the sausage to the pan and mix with the tomato mixure, breaking up some of the tomatoes. Let sit at low heat while pasta cooks. Cook the orecchiette pasta according to package directions. Drain pasta and return to pot. 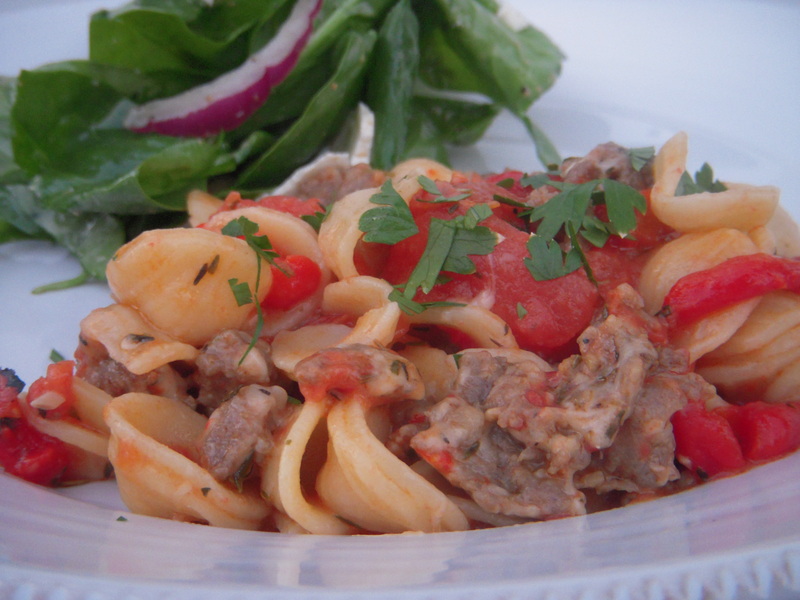 Add the sausage and tomato mixture to the pasta and toss. Add parmesan cheese and toss as cheese melts. Serve each plate topped with chopped, fresh parsley. I hope you love it! We did!